The theme is responsive, so that it fits and looks great on different devices – desktop, mobile phones and tablets. Also, the main gallery slider supports finger gestures, so it is very easy to navigate between the images on touch devices. The theme comes with 3 base skins – Dark, Light and Dark Transparent. After you choose your skin, you have options to change the colors and background used in the theme. We have also included a color picker to make color choice even easier. Additionally, the theme comes with 34 different background patterns that you can choose from and if you would like to use your own custom background, the theme also provides an option to upload your own background pattern image or full width background image. The theme provides a friendly user interface to implement Cufon Font replacement and Google API Fonts. Additionally, we have included a “Beginners” section which includes some helpful links about working with WordPress and instructions about what steps to follow when setting the theme. 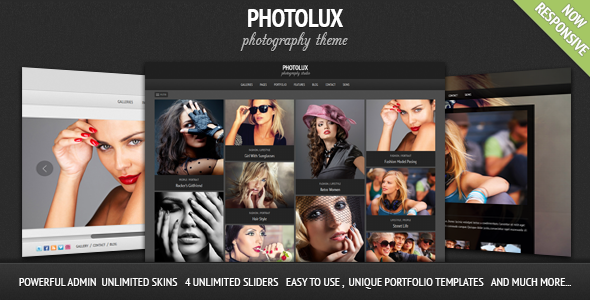 Share the post "Photolux – Photography Portfolio WordPress Theme"